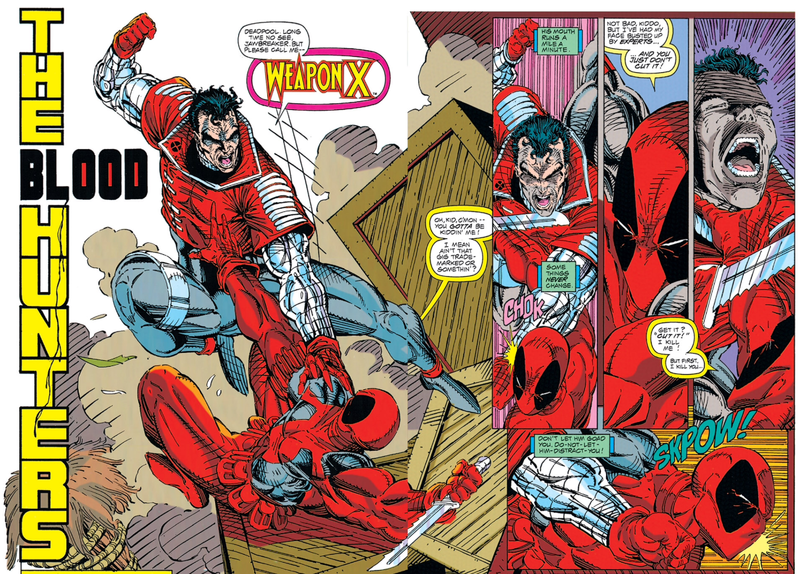 The new Weapon X battles Deadpool, and Feral guts Cannonball. In Canada, Deadpool oversees the theft of a shipment of defense software sought by Mr. Tolliver when he's attacked by Kane, the new Weapon X. 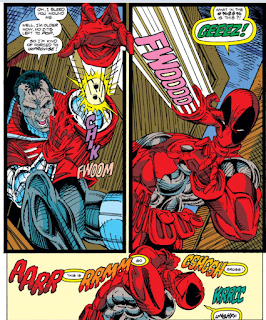 The two fight, and Deadpool is defeated when Bridge intervenes, looking to speak with Kane. Bridge asks Kane to join him in hunting down Cable, and Deadpool teleports away while they're distracted, but Kane declines, telling Bridge to bury the past. Meanwhile, X-Force trains in the woods outside their headquarters, but Feral takes things too far, and in the heat of the moment, eviscerates Cannonball. He survives, but both he and Cable are left wondering what to do about Feral. Meanwhile, at the World Trade Center, Arianna Jankos' scientists finish work on a device, the completion of her agreement with Black Tom, which teleports Juggernaut back to Earth. 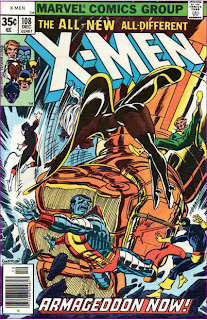 This issue marks the first appearance of Kane, a Canadian agent who is said to be the latest iteration of Weapon X. Barry Windsor-Smith's "Weapon X" serial in Marvel Comics Presents concludes the same month in which this issue is on sale, and Liefeld is the first creator to run with the idea that "Weapon X" is the name of the organization which created Wolverine, and not just Wolverine's old codename, here bestowing the title on a new character and referencing the Weapon X program in dialogue. Kane is the perfect Liefeld creation: one-part a kewl 90s design element (cybernetic arms), combined with a connection to an existing character or concept to give the character immediate legitimacy and a hook for long-time readers (here the Weapon X project) along with a gimmick that seems cool at first, but quickly becomes ludicrous the moment you think about it (like Shatterstar's double-bladed swords; here, it's Kane's detachable hands). Like so many other Liefeld creations, Kane will not long outlast his creator; he'll make some guest appearances in Wolverine and early issues of Cable's ongoing series, then mostly fade into the background until the ongoing Weapon X series, which specialized in dusting off characters connected to the program or largely going unused, would bring him back, but he died in the course of that series and has yet to be resurrected. It's established that Kane has a past with both Bridge and Cable; like Bridge, Kane will be revealed to be have been a member of Cable's pre-New Mutants mercenary team, and carries a specific grudge against Cable, the cause of which will be detailed in Cable's upcoming limited series. Deadpool returns in this issue, hot on the heels of his appearance on one of issue #1's five trading cards. It marks his second comic book appearance. During a training exercise, Feral takes things too far and more or less guts Cannonball; the speed with which he heals from this injury will factor into an upcoming storyline, while Feral's actions will continue to be a point of contention among the team, referenced fairly regularly, moving forward. Where Black Tom goes, Juggernaut can't be far behind, and sure enough, he shows up at the very end of this issue, retrieved by Black Tom's partner Arianna Jankos as part of the deal that had Tom holding her would-be buy-outers (including Gideon and Sunspot) hostage (it's unclear how long they've been held hostage at this, though it seems to be more than a few hours, which seems...wrong. Like, at this point, there should be police and media coverage and whatnot, especially since the hostages are likely among some of the more wealthy people in the country). 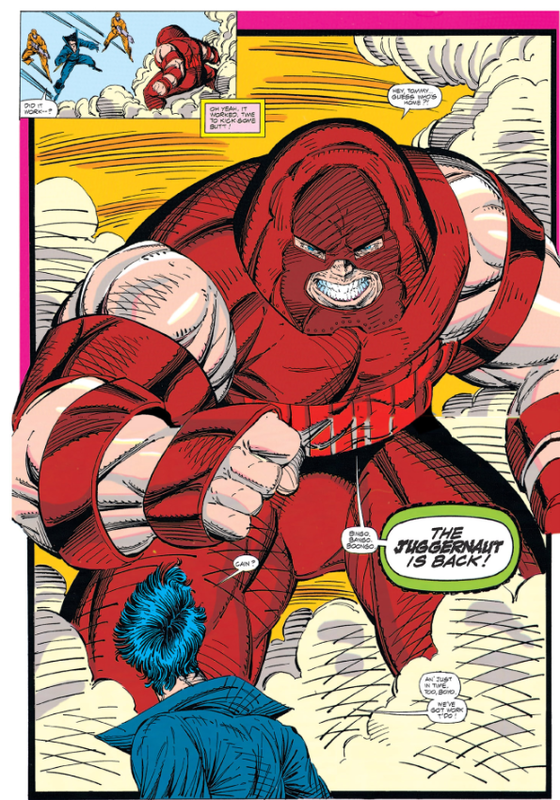 Juggernaut last appeared in Thor #429 (the story in which Excalibur guest-starred), where he was left floating in outer space by Thor. He's returned to Earth this issue via a teleportation device created by Jankos (and kudos to Nicieza or Liefeld or whomever remembered that Juggernaut was last seen in outer space and couldn't just show up at Black Tom's side without explanation). Kane mentions that he hates the Weapon X program. 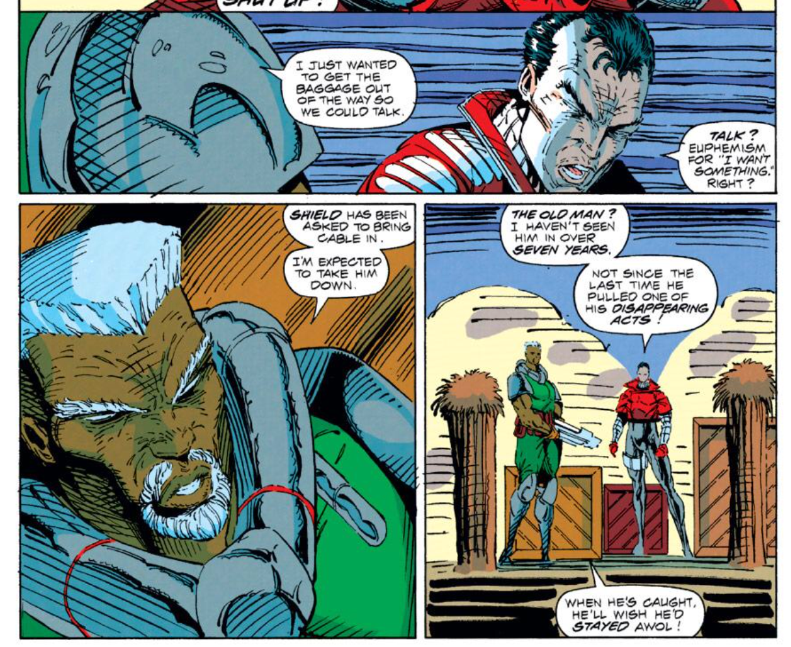 It's also suggested that he's pushing 35, which of course makes him positively ancient (somewhat ironically, Kane will eventually be depicted as the youngest and most immature of Cable's old mercenary group). Mr. Tolliver, like Deadpool, last referenced in New Mutants #98, is said to be connected enough that some Canadian officials don't want to see him taken down. Boom-Boom debuts a new pair of wrist launchers this issue, devices which presumably enable her to launch her time bombs further than she can throw them, though Liefeld can't be bothered to draw anything distinctive on her wrists throughout the issues. Feral refers to Domino as Petey the Dog, the dog from The Little Rascals, who had a black circle around one eye. Speaking again to the purported goal of making X-Force an extreme, proactive version of traditional superhero team, this issue, like the previous one, is perfectly cromulent: the centerpiece of the issue is the return of Deadpool and the introduction of Kane, which, in the short-term, moves forward the "SHIELD is after Cable" subplot established last issue while also establishing Deadpool as a recurring foe (and a member of X-Force's limited rogues gallery). After that, it's a standard "downtime with the team" routine, followed by a more immediate setup for next issue's main plot. All of which, again, is fine, and perfectly in line with what the second issues of series can and often should do, but none of that really speaks to the team being proactive or extreme!. The closest thing we get is Feral eviscerating Sam, but the rest of the characters, even Cable, make it clear she went too far, making it a statement of her character rather than of the team as a whole; again, this isn't terribly different from what we got from Wolverine in early issues of the "All New" X-Men. All of which just speaks more to the fact that, for all his talk, Liefeld isn't really interested in reinventing the superhero team for the 90s, he really just wants a high profile platform for him to do whatever he wants, to stuff the series with as many "badass" and "cool" characters as possible, to pay lip service to the idea of doing some different but really to just do the same thing, but with more guns and metal arms. 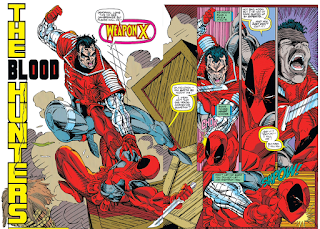 Thus, even now, with the reins ostensible off and beholden to no one but his own creative impulses, Liefeld still remains all style and little substance. Tomorrow, Peter David comes aboard in X-Factor #70. Next week: Wolverine: Bloody Choices, and the Beast story in Marvel Comics Presents #85-91. "until the ongoing Weapon X series, which specialized in dusting off characters connected to the program or largely going unused, would bring him back, but he died in the course of that series and has yet to be resurrected." "it's unclear how long they've been held hostage at this"
"though Liefeld can't be bothered to draw anything distinctive on her wrists throughout the issues." Just like the way he draws guns, since has bands around her wrists, we're all supposed to assume that they are there. Also, doesn't it look like Liefeld had a MUCH skimpier outfit for Tabitha during that training exercise, but the colorist turned it into a full body suit? "this issue, like the previous one, is perfectly cromulent"
Oh Teebore. Stop trying to embiggen the quality of this issue. This is just bad. The fact that this series seems to have forgotten it's purpose while we're only on the second issue, the horrible art...ugh. I mean, look at the bottom right panel in that scene of Feral gutting Cannonball. Liefeld drew 2 Shatterstars in that same panel! And the one behind Cable has his ponytail coming out of the right side of his head. People mention Leifeld can't maintain any consistency from panel to panel, but he can't even maintain it within the same panel. And somehow this guy ended up becoming a millionaire! Life just isn't fair. Yeah, definitely. She's clearly wearing some kind of tank top, but Vancata just colors everything purple. Oh Teebore. Stop trying to embiggen the quality of this issue. Heh. Well, the point I was trying to make was, as far as second issues of new series go, this isn't doing anything wrong: introducing a new character, furthering subplots, setting up a new story for next issue, spending "off" time with the characters. It's problems all lie with it specifically being the second issue of X-FORCE, a series that is supposed to be doing things differently. Which it's not. The characters aren't being proactive and the only extreme thing that happens is presented as the actions of a pretty standard "team wild card" character. 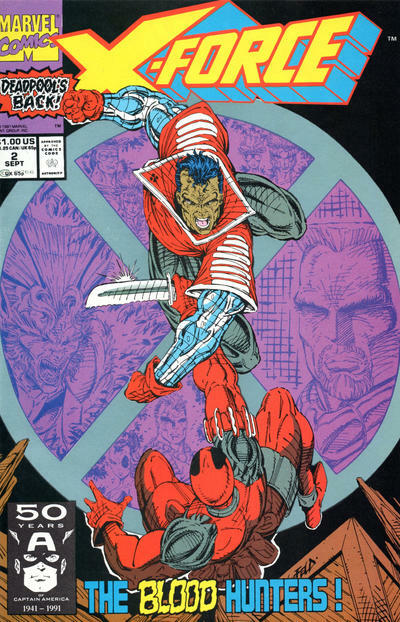 And because it's X-FORCE, it's drawn by Liefeld, so yeah, the art is pretty terrible. PS I love how in that double Shatterstar panel the word balloon looks like maybe it was positioned in an effort to cover up the second Shatterstar, but couldn't quite do it without also obscuring most of Cable. "It's also suggested that he's pushing 35, which of course makes him positively ancient"
Of course I had to buy the first issue (because it was a first issue with "X" in the title, and poly-bagged with a card, and was therefore going to be WORTH SOMETHING! ), but one wonders why I bought the second one. I think it was another three issues later before I finally realized it was just bad. The captions are Kane’s, like Anonymous says, so Deadpool is the one who’s pushing 35 — which supports all the dialogue from Deadpool, the obviously older Bridge, and Kane himself referencing Kane’s youth. So Liefeld & Nicieza introduce Kane and bring Cain back. There must be an untold Spider-Clone story set during the events of this issue that involves Kaine. I've heard Kaine appearance here was nixed last minute by the Spider-Man editorial, because Liefeld's take would have left him too much an overkill with hands that both burn and hover. It's also been my experience that hack writers love naming characters Kane or some other variation (Caine, Cain, Kain, etc.). No clue why, but I've seen way too many characters with this name, usually in independent small-press stuff. If I had to guess I would pin it on the Cain & Abel thing. Be it any take on the symbolism of Cain being the first born human, the first murderer, an agriculturalist in the world of hunter-gatherers and shepherds, it all harks of dynamicity and different, edgier approach to matters. A real first 90's antihero of the Genesis.